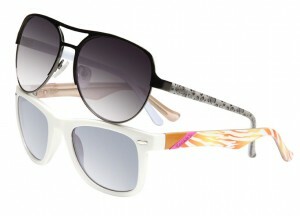 Viva International Group introduces a new sun line to its Candie’s ® Eyewear collection this spring. The 12 new prescription-ready sunglass styles are fun and fashionable, perfect for the trendy lifestyle of today’s Candie’s girl. Bold silhouettes, including wayfarers, aviators and glamorous ovals are offered in colourful combinations with chic temple treatments, such as animal prints, heart designs and floral patterns. Enticing animal prints, also found in the brand’s extensive accessories collection, bring inspiration to the new sunglasses, including key styles COS Adison and COS Isabel.Templesdetailed with a vibrantly coloured animal print design compliment the fun, wayfarer-inspired styling of COS Adison with a pop of colour, including orange, green and yellow. A metal plaque featuring the Candie’s logo completes the look of this sporty style. The flat metal styling of aviator-style COS Isabel presents handmade acetate temples adorned with an animal pattern in neutral tones of gold, plum and gunmetal. The dramatic round shape of style COS Dani is offered in rich handmade acetate and features a colour-filled Candie’s logo etched onto each temple. Gradient lenses accentuate the translucent colour finishes available in black, plum and brown. Merchandising materials include 3-piece, 12-piece and 24-piece displays, mirrors, logo plaques and counter cards, and banners featuring the current campaign image, as well as a window display new for 2013.